“Eastern Ghouta was sheltering “400 000 moderate rebels””. This is what the press and Western governments asserted. However, the military operation of the Syrian forces undertaken with the support of Russian military units, in the context of the cessation of hostilities with the Syrian Rebels (Resolution 2401), produces a completely different result. 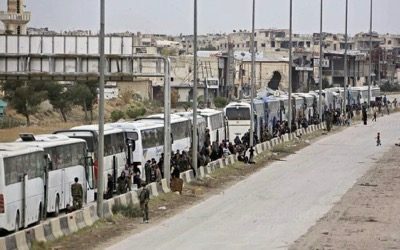 another 7 000 persons, probably foreign jihadists and their families have been evacuated under escorted to Idleb. Around 1,500 were hoplites. This produces, on Saturday 24 March, a total 113 000 persons. This is a figure far smaller than the 400 000, which is the figure that the NATO member states gave to the UN Security Council. Not one of them presented themselves as a “moderate rebel”; nor has anyone requested protection from Russia. Freed Syrians testify that that the jihadists had enslaved boys that were able to build fortifications and dig tunnels. They also denounced the atrocious living conditions that they had been submitted to. The same type of observation was made in Aleppo in December 2016. 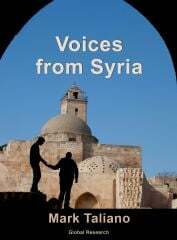 Syria never imploded in civil war. Instead it was made to explode. This was through an attack emanating from outside Syria; an attack that had been planned and sponsored by the West . Featured image is from Voltairenet.org.